Punnett's Square: Who's a good... Wolf? The loyal dog's we know today, are relatives to the wolf. They are our trusty companions but why? Where did the floppy eared, big eyed, goof we know today come from (yes there are dogs that are bread to have ears sticking up as well)? Evidence points to dogs being our longest and oldest companions being domesticated not only from a single area but from multiple points all around the world. Many have hypothesized how wolfs ended up becoming domesticated. Some believe that we actively tried to domesticate them to be used for hunting, helping our ancestors and acted on their own accord. Others believe that the wolf (some) began to follow our trail of scraps left behind in search of food themselves and that they had a trait in their genome that was more tame that would allow for us to allow for them to approach us. From studies done we know that the Eurasian grey wolves around 10,000 to 40,000 years ago were domesticated. Dogs that we know of today like the Doberman, Maltese, Pitbull, Pomeranian, and ect. were not what the early traits were sought out for physical aesthetics but rather only that they do not hurt us and are friendly. It should be known that the traits for behavior and physical attributes are linked in a way. They are the NCC or neural crest cells, and biologist have focus in on these as they believe this is what was the catalyst for the domestication syndrome. The group of scientists involved in this study decided to look into 429 different genes in forty three wild village dogs from four different continents. Focusing on genes that act in early embryogenesis. They then compared these village dogs to "ancient dogs older than 5,000 years" (1). What they found was a similarity in their genome sugesting that these traits were the result of original domestication. This shows that the later attempts of domestication to different specific breads was not the cause for the tame like trait we see in dogs. Even with this new information we do not know how domestication took place but we do have more insight into it. We may never know why or how specifically this domestication of our fury friends happened, but what we do know is that they were part of our journey so far and are not going anywhere in the near future. The dogs we know of today will continue to change in features as we deem to be necessary/aesthetically pleasing. P.s DO NOT try to domesticate wild wolves. I think this article is very interesting as the domestication process in general not only amazes me but makes me wonder what causes some animals to be domesticated and some animals not. But I think it is meant to be that some animals (e.g. 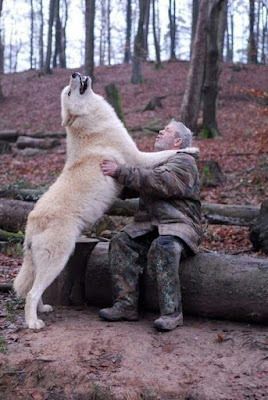 wolves) are able to live on their own and there should be no reason why we need to domesticate them.